Peridot carries the gift of inner radiance, sharpening the mind and opening it to new levels of awareness and growth, helping one to recognize and realize one’s destiny and spiritual purpose. Peridots have held significance for thousands of years. Whether worn as an amulet of protection or for increase in one’s love and happiness, and profit, it was required to be set in gold for its virtues to be the most powerful. Peridot Drops Faceted Long Drilled Beads. 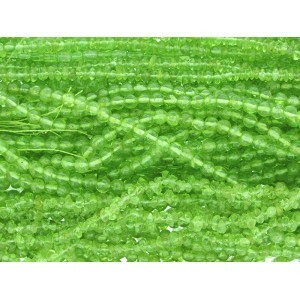 &n..
Peridot Square Beads, strand approx. 16''. The strands are in 2 bead sizes: smaller - approx. 2.8mm ..